That quality of the game—wherein every other move is a difficult decision, the decisions never get easier and indeed get harder as the game progresses, and where luck can really ruin your gambit if you’re not careful—really doesn’t make for a relaxing game evening, especially solo. I usually solo with two decks, since soloing with one is a recipe for disaster if the encounter deck decides you’re looking at it funny. As an example of all of the above, in this game the encounter deck decided to throw one “Caught in the Web” at me, then discarded a rather nice attachment ((In Magic: the Gathering terms, an enchantment.)) 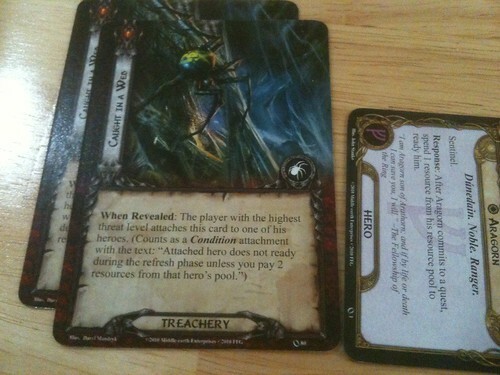 called “Steward of Gondor” on turn three, and then threw another “Caught in the Web” directly thereafter. “Caught in the Web” is a nasty, nasty attachment, and to have two of them tossed onto your most useful, primary hero is just wrong. Morally speaking, of course; it might still be the right decision to make from a strategic standpoint. Or really, from a damage mitigation standpoint. I did choose Aragorn to receive the Web both times because at least he has a slightly cheaper resulting readying ((MtG: untapping)) cost than the other heroes, at least if you average it all out over multiple turns. This was a difficult decision to make, but it was the right one. And it meant that the steamroll was going to turn into a fight to the end, which it ultimately did. The decks I was using for this particular game are sourced from here: “Aragorn, Steward of Gondor” ((Not so much, as it turned out.)) and “Tank and Spank”. Allies, elves and human alike, died as Chieftan Ufthak and spiders tore through them. 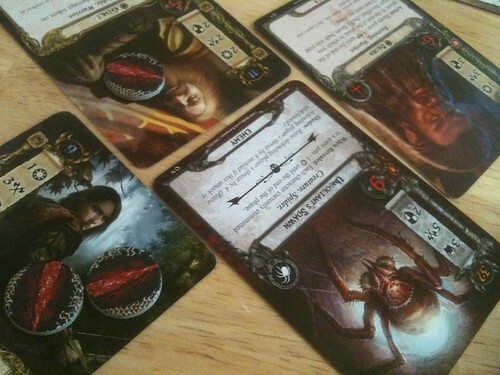 Theodred and Dunhere sacrificed themselves to give the others enough time to get at Ungoliant’s Spawn. Aragorn managed to untap ready himself and leaped across to defend a slash from one of the other spiders ((There were four on the table along with Chieftan Ufthak, which did not make for fun times.)) attacking Gimli’s group. Thus allowing Gimli (a bit upset with one wound on him, giving him +1 to his attack for an attack of 3) time to hit Ungolient’s Spawn. Legolas joined in from afar, dealing an attack of 3 via trusty bow and arrow. Beorn turned into a bear with an attack of eight. He cost quite a bit in resources to convince to come and fight. The hide of Ungoliant’s Spawn soaked up 5 of all those attack points, and but nine still found their mark—which was exactly the amount needed to kill it. One less, and the next turn everyone would have been dead. Awesome game. Not a relaxing one (the final score being 112, which is on the high side—higher is bad with this scoring system). 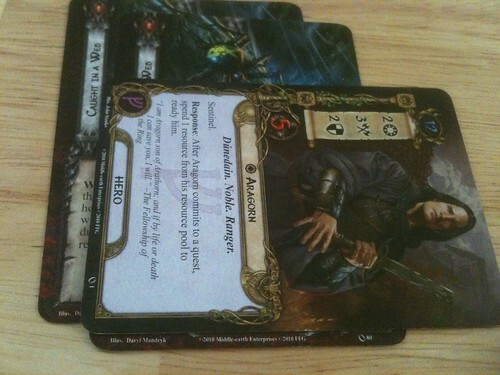 Also, Brok Ironfist is only slightly above useless in “Aragorn, Steward of Gondor”; he can only replace a fallen dwarf hero in the deck itself (and not in a teammate’s deck). 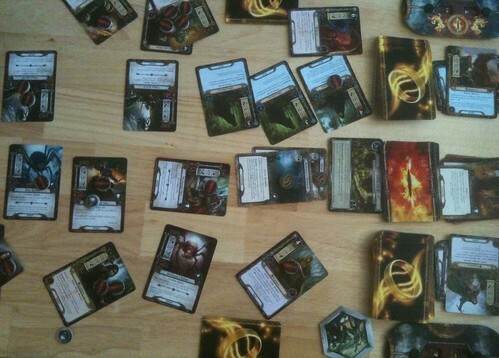 The numerous dwarf allies in the deck don’t count, and none of the heroes in the deck are Dwarvish. Do yourself a favor and replace him with something else: another Horseback Archer, mayhaps, or another Quick Strike. I’m starting to log my games in the official Quest Log. It’s quite pretty.